A few days ago I made my way to Caimbridge to meet up with a long time flickr friend and blogger, Sheila. She took me on an antiquing/thrifting adventure, showing me all the tricks and tips in her area. I also got to play with her adorable pup Stella, and take a tour of her beautiful home and sewing space. Our first stop was the Southworks Antique mall where we donned the nickname "the crazy Pyrex ladies". It was great to have two sets of eyes looking around. 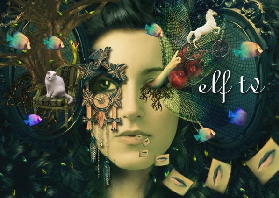 She found things I missed, and I found things she did. 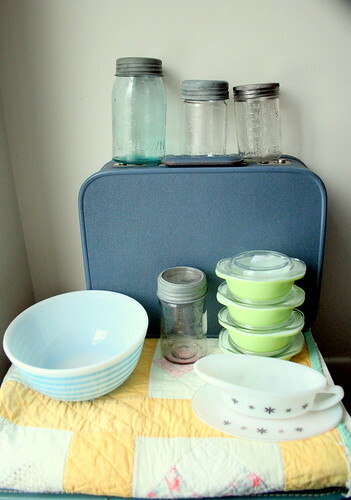 We came away with some great finds - a beautiful yellow quilt, a blue striped Pyrex bowl, a snowflake Pyrex gravy boat for Christmas dinners, lime green tiny Pyrex casseroles, some antique mason jars for wedding centerpieces, and a little blue vintage suitcase for me. She came away with some more Pyrex, and a mint condition Catherineholm Lotus plate. We almost missed that one! 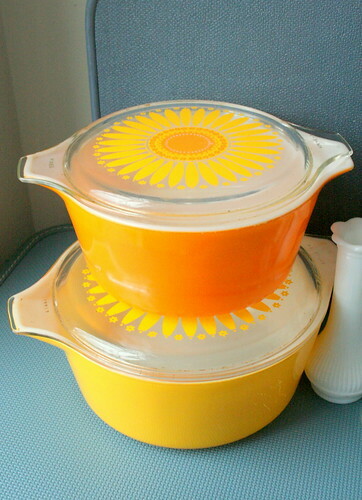 Our next stop was the thrift shops in the area, where we found these Daisy casserole dishes for $1.99 and $2.99. 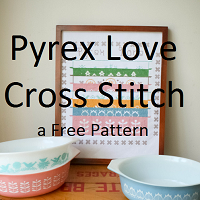 I had originally thought the price tag said $7.99 because I haven't seen Pyrex that cheap in years. 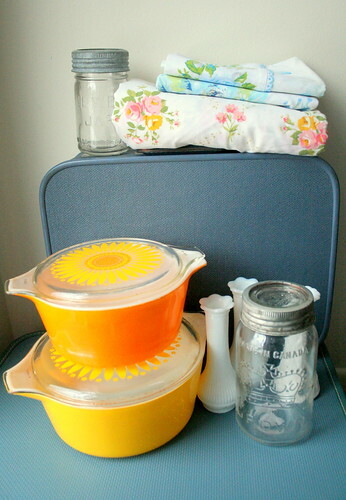 We also picked up some vintage sheets, some milk glass vases, and some more antique mason jars. I think Jer and I are all set in the mason jar department now. 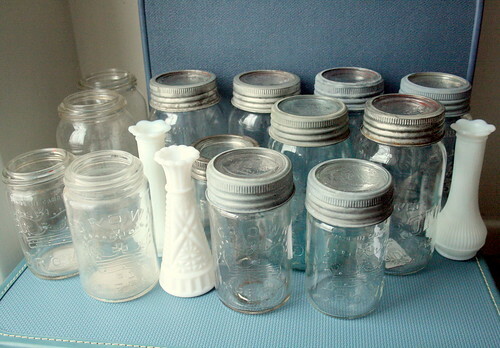 Sheila gave me a great tip - if you want to find antique mason jars, head to the thrift shops in small towns. People out there will have kept them in their garages and basements for years, and will finally be getting rid of them. The larger ones were two for 99 cents and the smaller were three for 99 cents. A big difference from the $3-$10 per jar in antique malls. In Toronto I've only been able to find the newer jars in thrift shops, so I've been buying jars from antique malls for $3 a piece! I wish I had known this when we first started collecting them. Afterwards we went to a local chain shop with a basement full of fabric. I could have spent days down there! 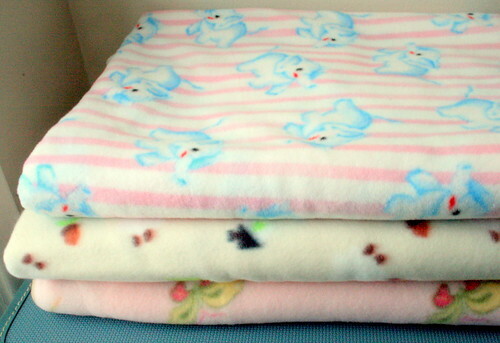 I picked up some fleece to make cage liners, hammocks, and fleecey tubes for the chinchillas. I'll be going back to stock up when I need to, rather than buying online. We finished off the day with a craft room tour, a sneak peak of some quilting projects, some great conversation, and a visit to Sheila's vintage sheet "shop" (she sells beautiful vintage sheets on etsy). 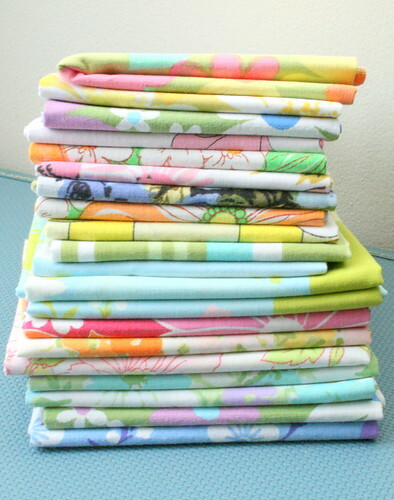 I picked up this great pile here. 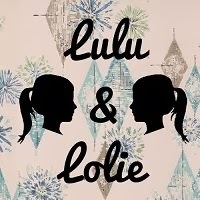 I'm tempted to use it to join in on the Oh My Stars! quilt along. It was a great day, and I can't wait to do it again.